f.24 'Soneput. Vide Asiatic Annual Register. A.D. 1800. Miscellaneous Tracts. p. 128. Ensign J.T. Blunt, B.E. fecit' (espy. p.147). Landscape with ruins. bl.uk > Online Gallery Home	> Online exhibitions	> Asia, Pacific and Africa Collections	> f.24 'Soneput. Vide Asiatic Annual Register. A.D. 1800. Miscellaneous Tracts. p. 128. Ensign J.T. Blunt, B.E. fecit' (espy. p.147). 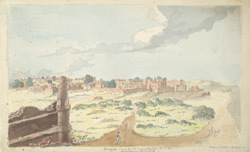 Landscape with ruins.